We took a short trip to Paris with a long food adventure. 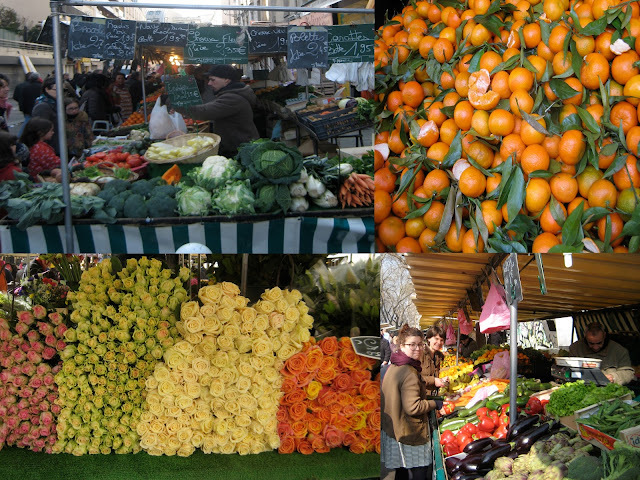 The most special thing about Paris are the farmers' markets. There are numerous in all areas of Paris on every day of the week (what a dream!). We went to about five this time and our favorite one was the Bastille (on Boulevard Richard Lenior between rue Amelot and St. Sabin. Metro: Bastille). Something for everyone there since it is very big. We found the best herb de provence there. It is close to the oldest farmer's market Aligre Marche (between rue du Faubourg Saint-Antoine and rue de Charenton. Metro: Ledru Rollin). We also went to a really long flea market Marche aux Puces de la Porte de Vanves (between Avenue Marc Sangnier and Avenue Georges Lafenestre. Metro: Porte de Vanves) which had all kinds of antiques but quite expensive. On Sundays they also have a food market where I last bought great herb de provence in bulk. For breakfast, people seem to rely on baguettes. It was funny to see that people really are obsessed with their baguettes there because we saw numerous people walking around chewing on baguettes. Many eat baguettes with jam and butter -- tartine -- for breakfast, and also all kinds of baguette sandwiches for lunch. We bought numerous baguettes, some warm out of the oven that tasted like cake. Divine. Some we used with fresh cheese that we bought at the farmer's market. It is only in France that one should be allowed to eat croissants because they are the most beautiful tasting there. Perfectly buttery and flakey. Just perfect. There are bakeries in every single corner of Paris. I went to one that was recommended by Chocolate and Zucchini that had the best quiche in Paris. Cute place. We also went to an Algerian bakery Fabriquee and were amazed by the vast array of pastries. It was really hard deciding what to buy there since everything looked delicious. Definitely worth a visit. As for warm nutritious meals, that was rather difficult since I hadn't researched enough where I could find vegetarian food that wasn't a cream sauce or a chevre salad. We ate a lot of couscous, thankfully, and also at a great Asian vegetarian place called Tien Hiang (92 rue du Chemin Vert) that our friends recommended. A rare occasion that I could choose everything on the menu instead of one thing and have it be truly delicious! 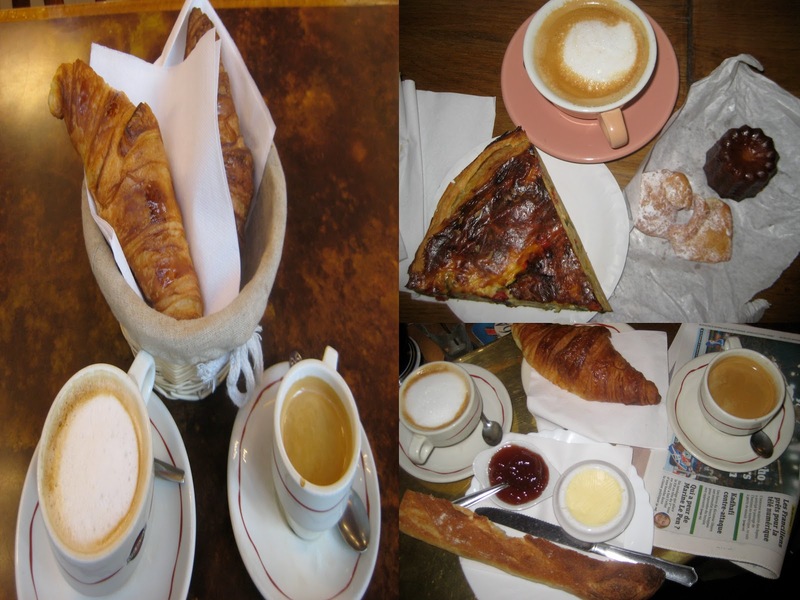 Our absolute favorite bar and cafe is Le Cafe du Commerce - 13 rue de Clignancot - which served us great cafe au lait, the best croissants and freshly squeezed orange juice. On our last day we took a walk by the Siene and saw the wind sweeping the weeping willow leaves towards the river. YUM!! I so miss Paris. There is no comparision to quches, croissants and baguettes anywhere else !